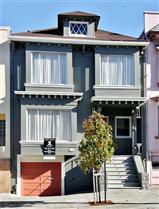 1522 9th Ave. is a wonderful original home in the Inner Sunset. Offers are due 1/13/11, so it’s a little late to get in the game, but it sure will be interesting to see what happens. Listed at $799,000, I expect this home to sell with multiple offers over asking. A two story, substantial home, built in 1909. Four bedrooms-all on one level, one bath, a fireplace and box beamed ceilings in the dining room, two car garage parking. And of course, a fabulous location in the Inner Sunset, convenient to public transit and all the great shops the area has to offer. Here’s a quirky little thing about it. A clinker brick fireplace in the garage! How’d that get there?! The house sold with 11 offers a lot over asking. The house closed escrow last week for $885,000-10% over asking.